Home > Lassen-Feather River History May 2015! Lassen Peak Erupted 100 Years Ago in May! 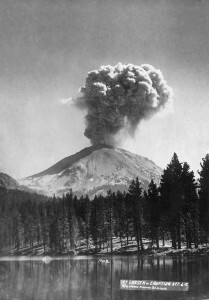 “On May 22, 1915, an explosive eruption at Lassen Peak, the southernmost active volcano in the Cascade Range, devastated nearby areas and rained volcanic ash as far away as 200 miles to the east. This explosion was the most powerful in a 1914-17 series of eruptions that were the last to occur in the Cascades before the 1980 eruption of Mt. St. Helens. Lassen Peak is the largest of a group of more than 30 volcanic domes erupted over the past 300,000 years in Lassen Volcanic National Park.” LVNP http://www.nps.gov/lavo. Honoring this event, 100 years later, is the vision of the Lassen-Feather River History Month. So, set your sights on the month of May for an explosive time of history and family fun! Make plans to visit Lassen Volcanic National Park and the communities of the Feather River. Each weekend will be filled with activities, tours and events extending from Lassen Park through Chester, Lake Almanor, Westwood, Greenville, Crescent Mills & Taylorsville. What are some of the things to do and see in May? Take museum tours honoring over 200 years of Logging, Ranching, Mining & Maidu Indian History • Visit displays depicting the awesome geological history of Lassen Volcanic National Park • Take Historical Walking Tours • Spend a 1940’s Night at the Museum • Attend a USGS Lecture Series at Lassen Park • Do a Local History Scavenger Hunt • Take a Tour of the Devastated Area from Lassen Peak Eruptions • Attend Local History Presentations and Lectures • Ride in the Indian Valley Century Bike Ride • Attend Children’s History & Geology Activities • Browse a Craft Fair • Take a Nature Walk • Visit the Indian Valley Gem Display • Visit an Art Show • Play a History Game • Discover a Local Geocache.